If you want to hide shower walls that are cracked, stained or aged, but don’t want to replace your entire shower, consider a shower liner from U.S. Patio Systems. We offer sturdy, custom-built liners that can be installed right on top of your existing shower walls, acting as a permanent recovering to refresh and renew an outdated shower. Meet with our team to discuss the upgrade you envision, and customize your new shower liner to meet your every expectation. 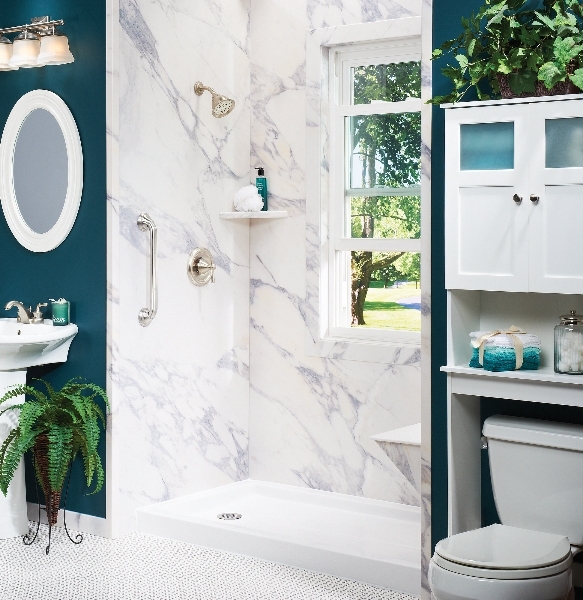 And with convenient fixtures and accessories, you can really make it your own—like by adding a tower caddy for extra storage for bath products, or a recessed soap dish for convenient soap access. Not only will your shower have a sleek, new look, you’ll also spend less time cleaning it: Each liner is made with 100 percent acrylic, which resists the growth of mildew, mold and bacteria. We’ll handle the installation in a matter of days. Afterwards, you’ll be left with a fresh, modern-looking shower that will look and feel like new. If you’re interested in learning more about our exclusive selection of shower liners, contact us today for a free estimate. We also offer liners for bath tubs, as well as replacement showers and replacement tubs, and want to help you find the solution that best fits your needs.